← Do you plan your bento? Bento from Beyond the Grave! I’m taking a break from the chronological bento postings to bring you something chilling, thrilling, timely and best of all, NYUMMY! Rest assured, the thing creeping from beyond the grave is something edible and not leftovers left too long in a bento box. Forming dirt is a bed of Crispy Corned Beef, an evil evil delight I learned about from one of my bosses, all laid on top of rice. Incidentally, cooking Crispy Corned Beef is a horrifying experience that’s only for the brave of heart—adventurers who fear nothing, not even sputtering oil—so that adds to the thrilling factor. The winning combination of corned beef and rice makes the nyummy part—I definitely can’t wait for lunch to come. The hands creeping from the dirt and the headstone is made from singkamas (jicamas) adored with nori. Finally, the flower laid against the gravestone is made from a bit of tomato and spring onion. That’s it for Halloween Bento 2008. 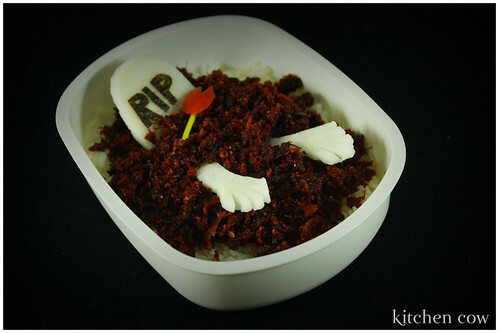 18 Responses to Bento from Beyond the Grave! yes — please let us know if Crispy Corned Beef requires anything other than risking death to get all of it WELL WELL done!! I can imagine this — girding my loins, opening the tin of Corned beef hash and just trying to hang in till it is all cooked – truly crispy cooked — dodging the hell bent splatters along the way! Awwww, that’s so cute! How did you cook the Crispy corned beef? Hahahaha! This is just funny and brilliant at the same time! I love it! How creative! I’ll make something along its lines for Nathan. recipe for the crispy corned beef please! I’m with everyone else… recipe please? It’s super cute. I love love love corned beef — and I love the crispy, almost burnt kind even more. Plus I love how you’ve turned it into a timely bento. Win! Yes, please post the crispy corned beef recipe! I would love to make it, even at the risk of spatter and a messy kitchen afterwards! food that truly makes you fear for your life while cooking it, AWESOME! No real recipe e, it’s really just stir-fried corned beef. Just stir-fry in a small amount of oil (1 tbsp max) and don’t stop stirring so it doesn’t cook clumped up. Oh, and I used Samba brand corned beef. According to my boss, she has tried other brands (Purefoods, Argentina) but only Samba crisps nicely. I trust her judgement so I didn’t bother testing with other brands—I just bought Samba promptly. I don’t want to experiment na, the brand we usually get (Palm or Hereford Chunky) is too precious to me to experiment on. Thanks! I had fun making it too, hehe. Hope Nathan enjoys it as much as I did! I toasted the heck out of small can of Libby’s corned beef. It’s yummy! No cute ghostly singkamas though, but yummy and crispy. Uy thanks for the heads-up. Is this the square can? Yung red and black? Yes, I bought a small can just in case it wouldn’t work as well, I think they have several flavors, but I used the basic one. It is the perfect foil for healthy brown rice. I paired it with japanese vegie curry too!